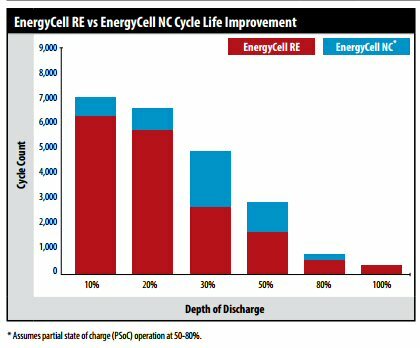 With limited sun hours for proper recharging of standard deep cycle batteries, the need for a Partial State of Charge (PSoC) Technology is greatly needed. This advanced technology will allow for extended life of a battery in self-consumption applications. Nano-Carbon offers all the safety and convenience of a VRLA battery with the cycling benefits of advanced energy storage. Operation of Nano-Carbon in an application where full battery recharges aren’t always possible, like off-grid or areas of the world with limited sun hours, can maximize your overall cycle life by up to 44% versus a traditional VRLA deep cycle battery. The Nano-Carbon is an enhanced and optimized negative active material formulation which makes it more than just a carbon additive. The high surface area carbon is a specially formulated additive for improving the negative active material in lead-acid batteries. Carbon increases conductivity and adds additional capacitance to the battery. Nano-Carbon improves charge efficiency and allows PSoC operation with improved deep discharge recovery.